Focus peaking is a sensor-based assisting function intended to help photographers acquire fast and accurate critical focus while using manual controls. It is an extremely simple yet useful tool to have in your photography arsenal. As I said, it only works when focusing manually. So with the focus peaking assist switched on, as you rotate the focusing ring on the lens, the display at the back shows a real-time visual representation of the areas which are currently in focus. Without the focus peaking functionality, what you had to do is eyeball the display and guess the parts of the image which are in focus. It goes without saying that this method is extremely unreliable and, frankly, is very difficult to master. You never know if you are in focus or not. Focus peaking uses actual visual data to locate areas of the frame which are sharp and highlights them so that the photographer/videographer can be absolutely sure. Not only finding focus is easier using this technology. Shuffling between two or more focus points also becomes a much simpler process. The last sentence of the previous paragraph was particularly important. Focus peaking was actually developed to be used for video productions. To make focus pulls easier. ‘Focus pull’ is nothing but shifting focus from one subject to the other which is present in the same scene to divert the audience’s attention. Earlier in the film days, an exact calculation was done. After many rehearsals and practice run, the focus ring on the lens was marked so that the camera operator knew exactly where to start and stop. It required an extremely fined tuned and choreographed effort from both the performers and the camera personnel behind the camera to get things right. Now with focus peaking, a one-man band is enough to film a decent movie on his own. The guesswork is what is replaced with this. With such incredible technology lying in wait, it was hard to keep the photographers away from it. Soon manufacturers started to offer focus peaking technology for still shots too. And no, it really isn’t overkill. Some situations and scenes do demand either extremely fast or very accurate focusing. Take macro photography for instance. Despite using aperture values of titanic proportions (f/32, f/45 is very common), rarely is the depth of field anything more than a few millimeters. This is because the subjects are shot using cameras centimeters away. If you are wondering why the distance of the subject from the camera matters and how it affects the image, read Subject Distance & Aperture Value | This Is What You Should Know for a detailed explanation of the phenomenon. Focus peaking may also come in handy in low-light situations when the autofocus of the camera is having a hard time getting a solid grip. If you have this assisting feature on your camera, for situations like this, you can switch to manual focus and using the real-time highlights onscreen, find focus by just twisting the focusing ring on the lens. Even though most of the cameras these days come with extremely good viewfinders and LCDs, there are still situations when it becomes very difficult to tell focus by just looking. For photographers who use glasses and have poor eyesight, it is a permanent problem. Even for photographers with perfectly good eyes, using the camera in direct sunlight is a chore. The screen at the back of the camera becomes practically unusable. Forget about looking at it and then determining focus based on the visuals. Now, these vary from camera to camera and you have to look around your camera menus to see if you got them. Most manufacturers these days give the option to change the color of the highlights used to show the sharp, in focus areas of the scene. Depending on what you are shooting, you may want to change the color settings to set a better contrast between the background and highlights color. So if you are shooting green grass you should probably use red highlights to better make out the outlines created by focus peaking. Red, green, blue and white are the most common colors offered. This is a little advanced feature which only a handful of camera bodies offer. It gives the photographer/videographer the ability to set a threshold after which the area is marked as in focus. Let me explain this. Now if you set the camera to the ‘Low’ mode. The threshold for determining focus is also set very low. Anything which is not in perfect focus but very close will also show up in the highlights on the screen. On the other hand, if you select a ‘High’ setting, only regions of the image which are extremely sharp would show. If you are lucky enough to have this on your camera, I would suggest you to use it on the high setting most of the time. It would help you nail to focus better and with much more accuracy. That’s what you are gunning for anyways. Although focus peaking was primarily devised to be used for shooting video, now it is used as frequently for still images too. But the application may be a little different depending on the type of camera you use it with. If you read the first sentence of this post carefully, you notice that I mentioned that it is a sensor-based technology. In other words, this means that the sensor is where the magic happens. Until the light reaches the sensor, the peaking technology cannot work. 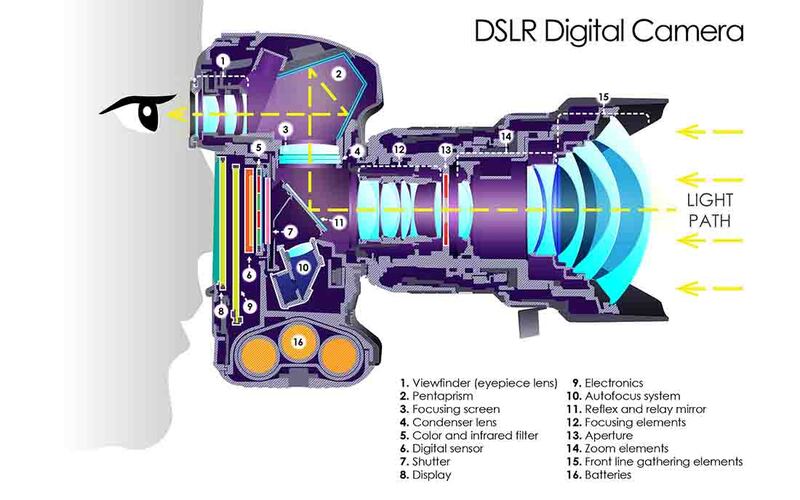 As you already know, DSLR cameras use a mirror mechanism to guide light into the viewfinder. So until the shutter button is fully pressed, the image sensor doesn’t receive the light from the lens. It is because of this particular reason that focus peaking cannot be used whilst using the viewfinder on a DSLR camera. If, however, Live View is used which flips out the mirror from in between and lets the light pass on to the image sensor. The camera may take advantage of this amazing feature. The new Nikon D850 ( a DSLR camera) has focus peaking built in but is only available in Live view and also when both the camera and the lens are on manual focus mode. For a mirrorless camera, there are no such hindrances as there is absolutely nothing in between the lens and the sensor. The light passes on directly. There is even an added advantage of using a mirrorless camera with focus peaking. You can choose to see the peakings on the Electronic Viewfinder (EVF) itself. There is no such option available for DSLR cameras though. You have to use the LCD screen at the back. For a more detailed discussion about Electronic Viewfinders (EVF) and Optical Viewfinders (OVF) and the comparison of their features, read Optical Vs Electronic Viewfinders | Which One Do You Need? That is focus peaking in a gist. If you have this available on your camera already be sure to use it as much as you can. Can’t do any harm. Another idea that popped into my head right now is that you can also use it with old ‘manual only’ lenses too. Nikon has been using the same F mount for decades now. Only recently has it come up with a new Z mount for its mirrorless camera bodies. So in case you have a Nikon camera with focus peaking and a really old lens with no autofocusing capabilities, you can simply use the peaking guides to focus. For some extra insurance, you can also use it in conjunction with the magnification tool. And don’t be so crestfallen if you have an older camera which doesn’t have this. If you really want to use it too bad, you can always get an external monitor which has it. For Canon users, there is even better news. You don’t even have to buy anything. Just install Magic Lantern on your camera and boom, you are off to the races. I have explained how you can install and use Magic Lantern here, Magic Lantern | Unlock Your Canon Camera Full Potential For Free. That’s all guys. Have fun.